From left to right: Dani Glaser, Founder/CEO of Green Team Spirit & Westchester Green Business Challenge; Jim Collingham, Owner of The Colonial Needle Company; Marsha Gordon, President & CEO of the Business Council of Westchester; Kevin Plunkett, Deputy County Executive of Westchester County. On June 5th, one of Bright Energy Service’s clients, The Colonial Needle Company of White Plains, NY, was recognized for their extraordinary energy efficiency efforts. 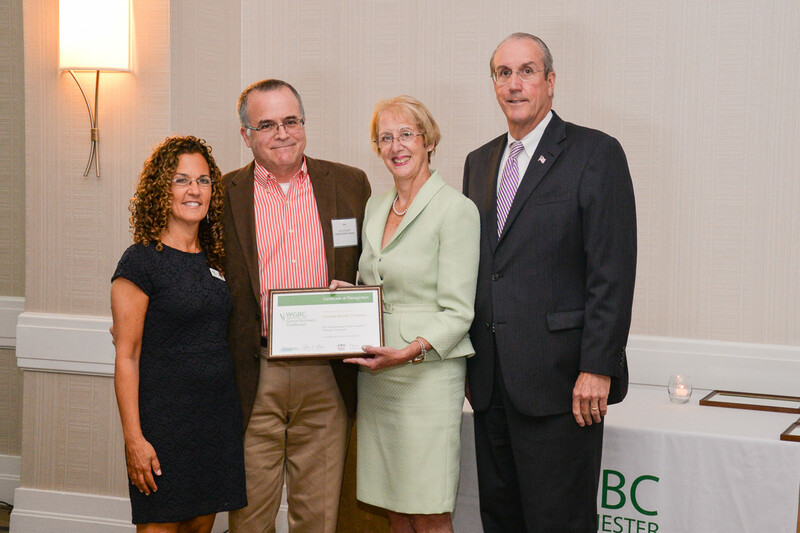 Hosted at the Crowne Plaza White Plains, the 4th annual Westchester Green Business Challenge (WGBC) announced the outstanding achievements of Colonial Needles as one of six Westchester-based companies implementing sustainable business practices. Westchester County Executive Robert P. Astorino and Dr. Marsha Gordon, President and CEO of The Business Council of Westchester proclaimed and recognized the exceptional undertakings of Colonial Needle in the category of Energy. The Colonial Needle Company, located in White Plains, NY is housed in two adjoining buildings and offers a broad range of needles, yarns, and other accessories designed to suit the needs of sewing, quilting, stitching, and knitting devotees of all skill levels. Constructed in the 1930s, the facility has had minimal modifications. The buildings had major energy issues including old drafty windows, high energy expenses, ineffective heating system, over-lighting and more. The cost for energy inefficiency was adversely affecting the bottom-line. The owners of Colonial Needle, Jim and Terry Collingham, decided to invest in and upgrade the buildings for energy efficiency. Jim Collingham contacted BES to do an investment grade energy audit with energy modeling and to help them identify financial rebates that were available for the energy efficiency projects that were recommended. BES provided technical advice, reviewed vendor information, and managed the effort to receive financial incentives from the local utility and from the State of New York for a full array of energy upgrades such as installing more energy-efficient windows, insulation, lighting, and replacing an oil-fired boiler with a smaller gas-fired unit with programmable thermostats. The roofs were converted into cool roofs with light-colored materials and greater insulation. Colonial Needle installed a solar-powered hot water system and a 60 kW solar PV system to provide for most of their electrical needs. The yearly savings in utility costs amount to approximately 65%. As a result of BES’s efforts, Colonial Needle achieved significant energy usage reductions, improved its staff’s working conditions, secured approximately $10,000 in financial incentives from multiple agencies, secured a tax deduction of $1.80 per square foot through EPAct IRS Code 179D, and enabled its space to be more attractive for leasing. All this was done while freeing Colonial Needle’s management to focus on its core business activities. In addition to their contribution to Colonial Needle’s successful energy programs, BES was recognized for its leadership as a green business in Westchester County and for their contribution to Colonial Needle. Call us today at (347) 470-7090 to learn what opportunities are available for your facility! Thank you, Dani, Scott, and Jana for recognizing the efforts that Colonial Needle has made in becoming more energy efficient. It is a pleasure to be here today! I originally started these projects in an attempt to make my facility more comfortable. In the winter, employees were wearing their coats indoors although the heat was cranking, and it was pretty drafty. We weren’t comfortable and we weren’t productive. Changing out windows, insulation, and roofing was what got me started. We were becoming more comfortable and I started saving money on my energy bills. Then we started upgrading building equipment such as lighting and HVAC to more energy efficient equipment. The energy savings and financial savings continued to build. Now, we are in the process of installing a solar PV system. I engaged the help of Bonnie Hagen of Bright Energy Services and Marc Karell of Climate Change and Environmental Services – both WGBC Participants – to consult with me on the energy upgrade plus secure the financial incentives for the improvements. I cannot thank them enough for helping this little small business customer, because without them I would not have filled out all of the paperwork and did the correct things to allow me to receive the rebate money I received! I am proud to say that that through the various initiatives we saved approximately 65% on our energy bill and we will continue to save more when the solar PV system gets completed! We also secured about $10,000 in rebate money and received a tax deduction last year of $1.80 per square foot, which is about $36,000. It pays to be green! I hope you all consider going green too! This entry was posted in Awards, Business Practices, Energy, Green Living, Solar. Bookmark the permalink.